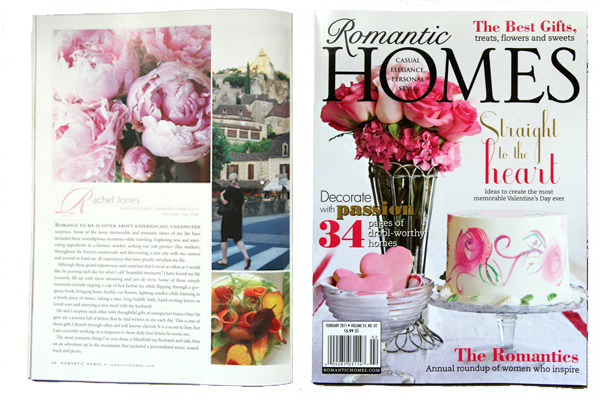 Being Valentine's Day, I thought it was appropriate to share my recent magazine press in the February issue of Romantic Homes. They asked me to talk about what I believe Romance is and I am very honored to be included in their annual "The Romantics" roundup with such amazing ladies, wow ... thank you Romantic Homes! Since it was tricky to get a good readable shot, you can read what I wrote below if you are interested... What about you, what does romance mean to you? "Romance to me is often about experiencing unexpected surprises. Some of the more memorable and romantic times of my life have included these serendipitous moments while traveling. Exploring new and interesting ingredients in a farmer’s market, seeking out vide-greniers (flea markets) throughout the French countryside, and discovering a new city with my camera and journal in hand are all experiences that have greatly enriched my life. Although these grand experiences and surprises don’t occur as often as I would like, by pausing each day for what I call ‘beautiful moments’ I have found my life instantly fill up with more meaning and ‘joie de vivre’. Some of these simple moments include sipping a cup of hot herbal tea while flipping through a gorgeous book, bringing home freshly cut flowers, lighting candles while listening to a lovely piece of music, taking a nice long hot bubble bath, hand-writing letters to loved ones, and enjoying a nice meal with my husband. He and I surprise each other with thoughtful gifts at unexpected times. Once he gave me a journal full of letters that he had written to me each day. This is one of those gifts I thumb through often and will forever cherish. It is a secret to him, but I am currently working on a response to those daily love letters he wrote me. The most romantic thing I've ever done is blindfold my husband and take him on an adventure up in the mountains that included a personalized music soundtrack and picnic." Amazing and yes so romantic. What a beautiful little article, Rachel. I love that your husband filled an entire journal with love letters for you. So Romantic! I may just have to give that a shot. How lovely to be featured in this publication! Love the images shared (and love that I was there to snap one of 'em! ).